her bare feet cut imprints in the ash layers. always on the hunt for the lost pieces, the path. She’s got a hole in her cheek where the last kiss rested. A gap in her hair where the wind once teased. Pried open ribs where hunger was known to dwell. to send messages to her lover under the Hill. like a tea saucer on a tiled floor. and her neighbors drifted up in clouds of dust. and tattered myths unwoven in the dust. and tiny alien flowers grow from blistered soil. 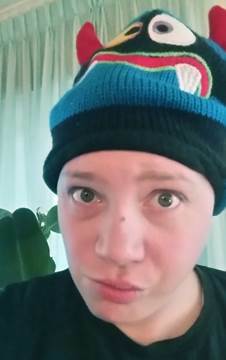 A. Merc Rustad is a queer non-binary writer and filmmaker who lives in the Midwest, United States. Favorite things include: robots, dinosaurs, monsters, and tea—most of which are present in their work to some degree. Their stories have appeared in Daily Science Fiction, Escape Pod, Inscription Magazine, Scigentasy, and Vitality Magazine, and forthcoming in Lightspeed, Fireside Fiction, and The Best American Science Fiction and Fantasy 2015. When not buried in homework, Merc likes to play video games, watch movies, read comics, and wear awesome hats. You can find Merc on Twitter@Merc_Rustad or their website: amercrustad.com.